The New Sheridan is his muse in Telluride. We are Roger Mason’s exclusive art gallery in Telluride, with dozens of his paintings throughout the hotel. If you have questions regarding Roger’s work or are interested in owning an original Mason piece, please see our concierge. Or catch Roger personally in front of the hotel as he works on his next masterpiece., which will likely next be hanging on the grand staircase when you come back. :: for more paintings and details see www.RogerMason.net. 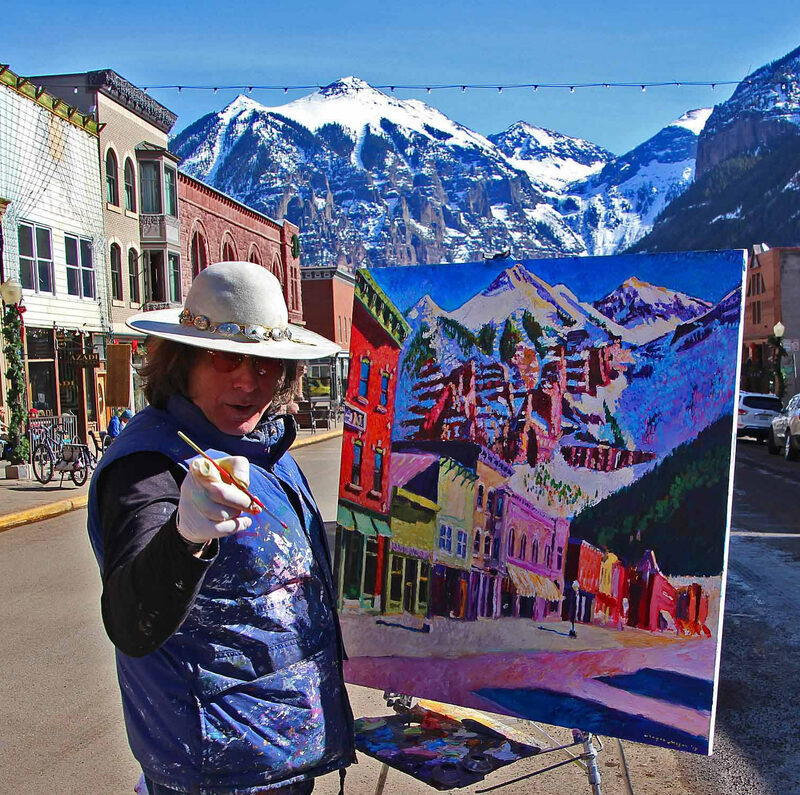 Many people use the phrase “blank canvas” metaphorically, but artist Roger Mason selects the New Sheridan Hotel year after year as his literal canvas and Telluride’s Main Street as his personal atelier. Mason hails from New York’s Hudson Valley and was trained at New York’s Pratt Institute. He found his way to Telluride through music. In addition to painting, he is also a renowned bass player and played for Peter Rowan at the Telluride Bluegrass Festival back in 1979. In the 1990s, he toured in a trio with world-renowned violinist Itzhak Perlman playing to crowds at places like Wolf Trap and Tanglewood. Mason also played bass with The Band. Painting is musical to him, and they both intertwine and fuel each other in an artistic way. Main Street is his studio. Through his extensive travels throughout the United States and Europe, he channels that inspiration as he stands on Main Street, his local studio. The town’s box-canyon setting offers dramatic lighting with heavy shadows that play upon colorful storefronts, lamp posts, cars, street life, and mountains. Mason typically draws a steady stream of onlookers when he sets up his easel in front of the New Sheridan. So the next time you’re in Telluride and strolling Main Street, make sure to be on the lookout for that man in the paint-splattered shirt.